a disconnected network of footpaths traversing Astoria’s forested hillside that are as fluid as the city’s evolving cartography. Astoria, a relatively small city of 10,000 people, is the northernmost town on the Oregon Coast. Being the rainiest urban environment in the United States (and second most in the US only to the Hoh Rainforest on Washington’s Olympic Peninsula in total rainfall) and built upon a hill surrounded by rivers on three sides, Astoria has both fluidity and tragedy in its very fabric. 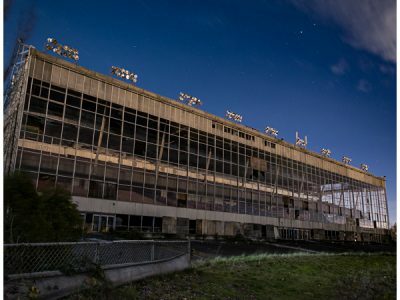 Having at one time lived in the town for 6 years, I was always fascinated by just how unconventional and prone to disintegration the place was. One of the things I was always fascinated by – yet was never able to find any information on – was the network of footpaths that wound their way throughout the steep hillsides of the town, connecting the points of an uneven and constantly shifting grid of streets. A quick summation of Astoria’s layout would be that the bulk of the town development lies on its northern slope, facing the Columbia River. It was initially established as two distinct but adjacent sections: Astoria proper and Uppertown, and has a slightly misaligned grid due to a difference in the size of city blocks in each section. Over time, and several sizable events such as fires (one of which was the costliest disaster in state history at that point), floods, tsunamis, major landslides as well as constant minor shifting in land due to the high annual volume to ground saturation combined with steep topography, the former logging town now has many streets that dead end, or have a gap of one to several blocks where the street is just absent, or have ceased to exist altogether. I ride a bike, and when I first moved to Astoria, I would spend hours just riding up and down every road, which became confusing due to so many inconsistencies in what had initially been a grid layout. I began to notice small paths throughout town, and would wander down each one I came across to see where they went. Some were as short as a few steps on an old concrete staircase to create a pedestrian connection between one dead-end street below, and another that also ended at that ledge immediately above. Some of these paths stretched for blocks, and were distinctly different from the hiking trails at the town’s fringes that went to certain landmarks. 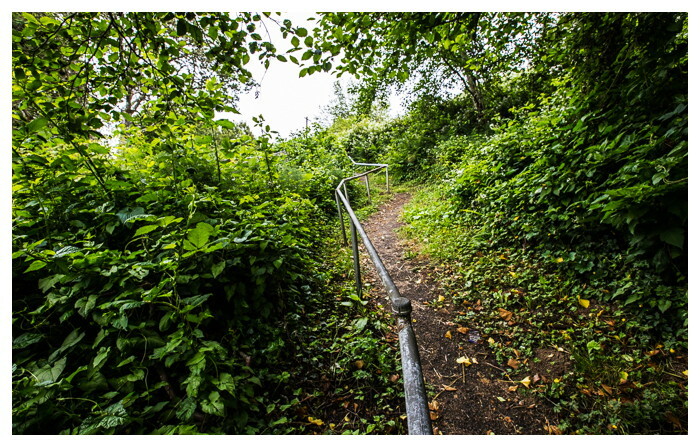 These trails – some paved, or with handrails, or even steps, or sometimes just completely overgrown and muddy and appearing as if only the deer had used them in the previous months – were strictly utilitarian paths bridging gaps that would force cars to take a roundabout route. 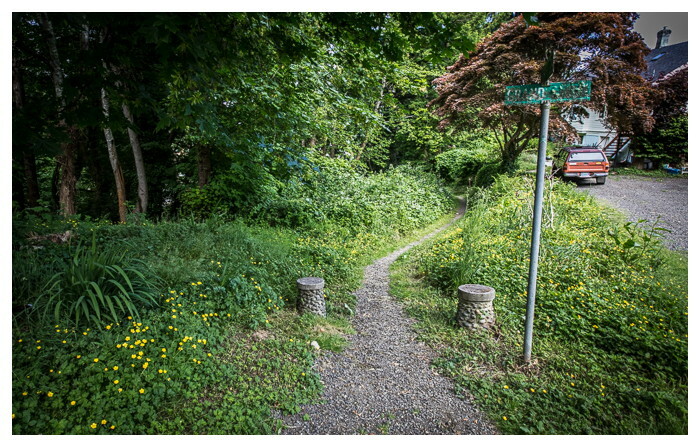 Over time, I saw that even the trails, which I had taken to calling Goonie Trails – after the badass youth-explorer-centric movie filmed largely in Astoria in the 1980’s! – were impermanent. 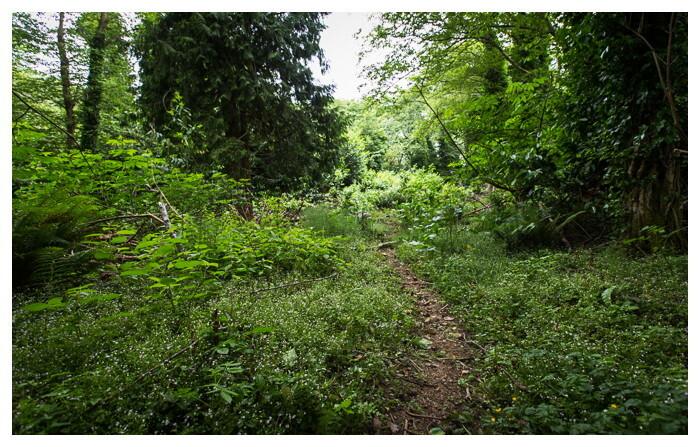 Trails that I had used to reach friends’ houses the previous season would become completely overgrown in the thorny blackberry bramble that grows so dense so quickly in this wet environment, that there was no way I would be able to use them without a machete at the very least. Meanwhile, new paths of stomped and trampled foliage would appear in places where there had been no trails in the previous few years. Sometimes the path would connect the same two endpoints, but have taken a slightly different route along the way since the previous season. It was even unclear which, and to what degree, trails were maintained in any official capacity. 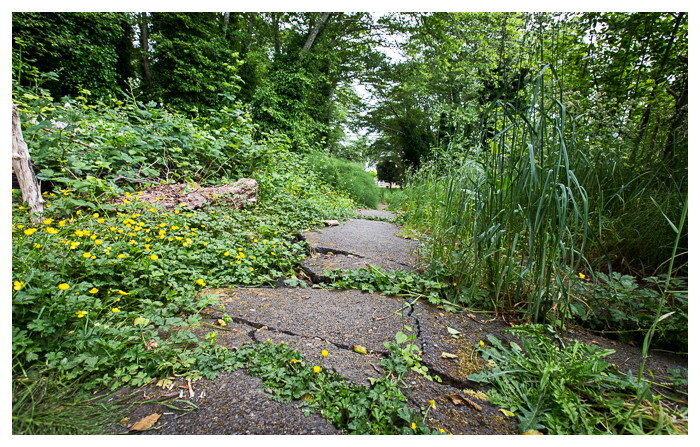 About once a year, the city would go through and trim back the growth crowding in some of the trails, and many had gravel, or wooden steps, or some amount of (usually old, buckling and uneven) paving. While others would be maintained by locals who would take their chainsaws to any downed trees that would appear. And still others had been roads, complete with houses lining either side, until landslides caused the homes to separate from their slipping foundations and streets to buckle and end up 15 feet below where they had started. Where the city couldn’t salvage at least a single lane and turn the road into a one-way street, they put up roadblocks, and locals took the broken chunks of asphalt and lined a new trail where the road had once been. 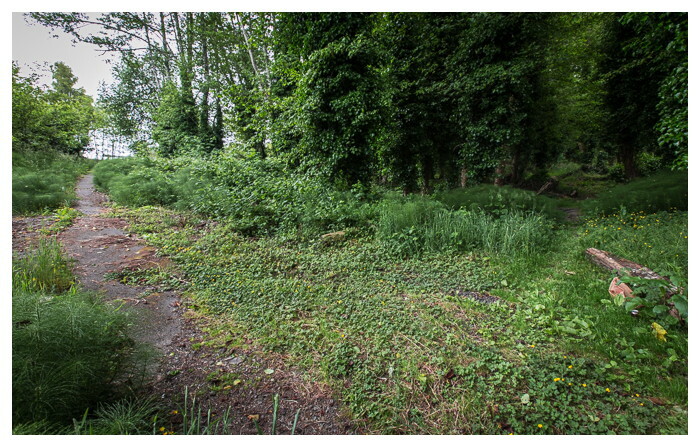 Within a year, those stepping stones were the only flat walking track after the bramble had grown through the former roadbed. 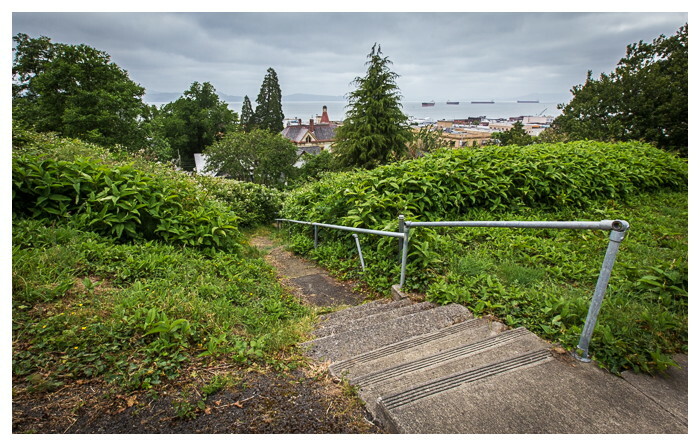 On another side of town, one main trail stretched from a street near the crest of the city’s ridgeline to a neighborhood of Coast Guard housing near the bottom of the hill, acting as a main artery from which smaller trails veered off to the ends of streets or to playgrounds along the path. 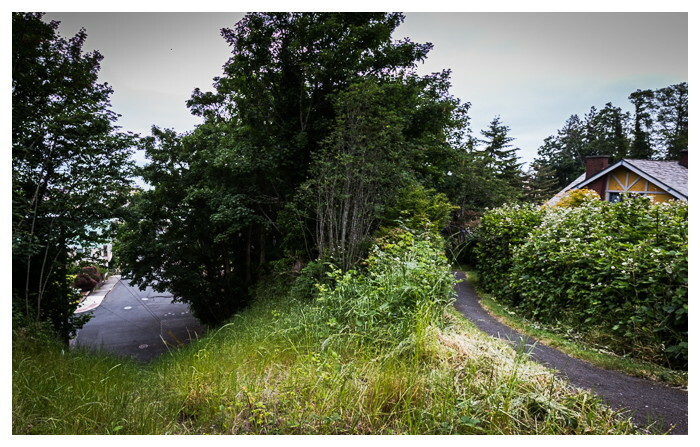 When two tsunamis converged on the city a few Winters ago, the wind blew down many of the large trees in town, and that trail has not existed since. 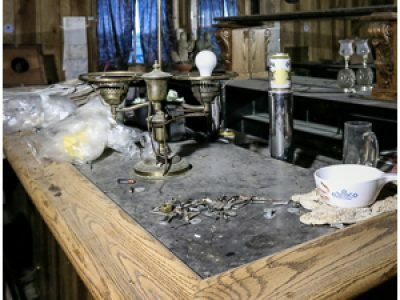 My last job in town had me in a position where I frequently interacted with different members of the city’s management team, and personal projects tended to have me in the city’s historical museum searching through old files and speaking with those whose knowledge of city history was encyclopedic, but no one really knew anything about the trails. Many of them did not even know of their existence, further reinforcing the Goonies aspect of the trails, where those who spend more of their time walking than driving knew of every shortcut and path in town, while those who did the opposite did not even know of the trails to begin with. I still find myself back in town often, and on these trips, it’s not uncommon for me to find myself using these trails in the hours after the sun has gone down or in those preceding its rise. When this is the case, I like to turn off my flashlight and try to navigate the paths by intuition, with the help of a small bit of light from the interoceanic freight ships anchored in the Columbia which is 4 miles wide at that point. On a moonless night, or beneath a stand of trees so dense that no moonlight can penetrate its canopy, I’ll walk slowly, the air so dark that it appears as if your eyes see orange rather than black. But I’ve found that usually I’m able to find my way to the trail’s other end. But when I get close to the other end, the lights of houses are visible through the forest. Tungsten-lit windows amid a black foreground almost like the scene of horror story. 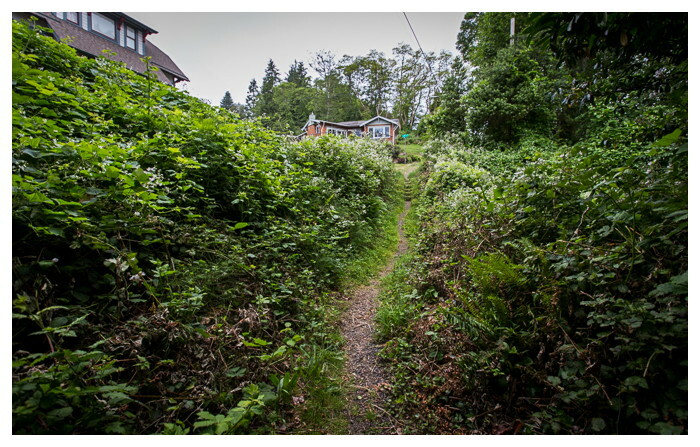 A trail emerging from the forest and onto a residential street. 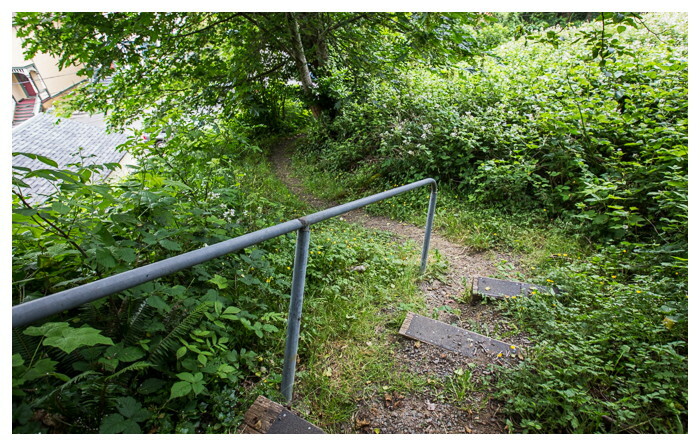 Crooked handrails on a steep climb. 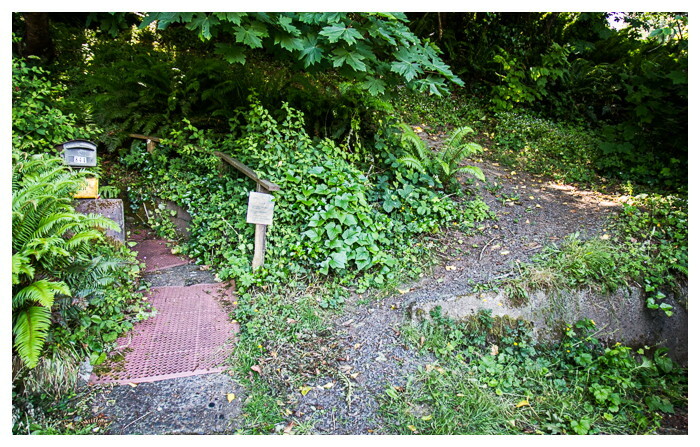 Some of the paths are narrow and have not seen any recent maintenance. Climbing from a gulch up to a hillside street. Formerly Duane Street, until a landslide took a large portion of the road. Now it sees use as a pedestrian path. Switchbacks climbing from river level to a parallel street above. 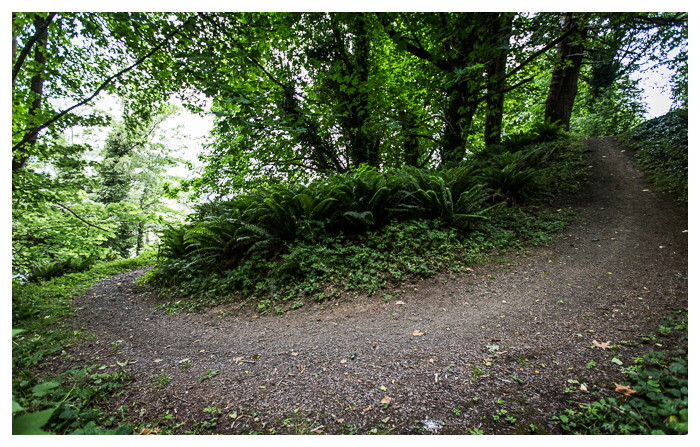 A maintained trail feeds a new trail (right). This path has paved stairs with a handrail, however at the bottom of the short set of stairs the asphalt is severely uneven and buckling due to roots. 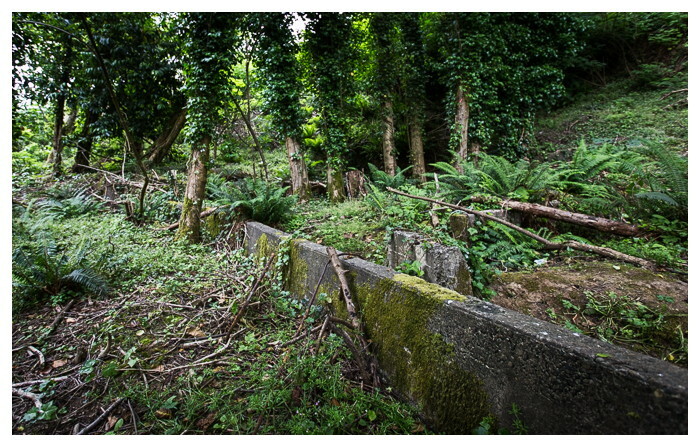 At one time a set of stairs was installed, now some are missing while the remaining steps are being overgrown. 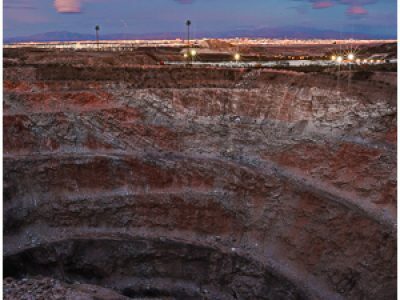 A foundation for a house lies in a gulch. All of the nearby buildings were forced to be abandoned due to landslides. Grass now grows where a street ran at one time, while the trail next to it weaves its way down below. 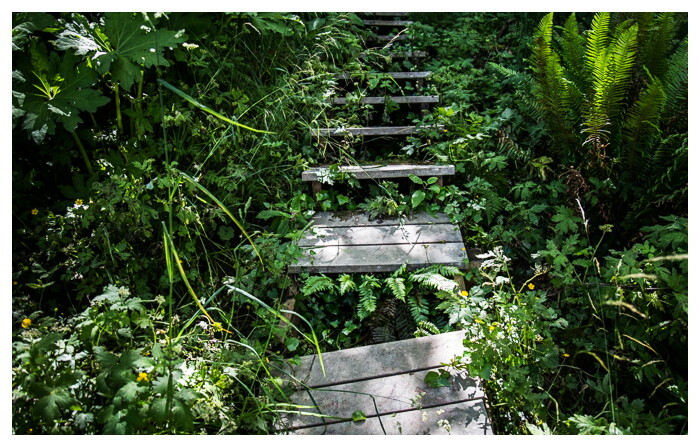 Many of the paths are unmapped and unmarked. 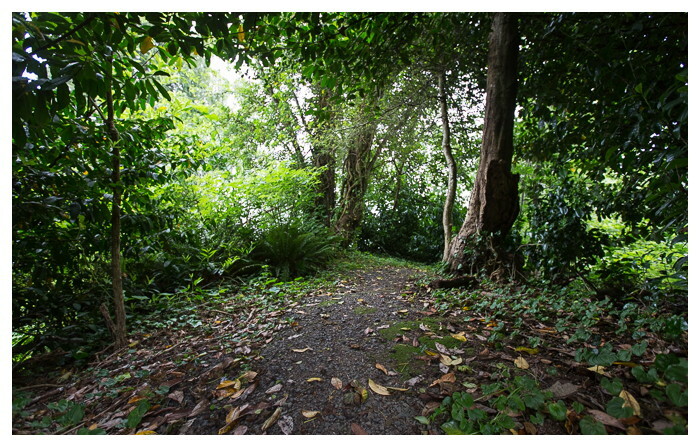 This trail begins immediately beside a walkway to a house that lies at the end of a quiet and secluded dead-end street.